Jharkhand Board 12th Result 2019: The Jharkhand Academy Council (JAC) has been declared the Jharkhand Board Intermediate result on June 2019. The students, who appeared in the State Board examination of the Jharkhand in current session 2018-19, can download their Jharkhand Board 12th Result 2019 using the official website link available on this page. NOTE: Candidate can check on the official website of Jharkhand Board 2019 for Name Wise Result of Intermediate. Check Jharkhand JAC 12th Timetable 2019 Here. How to Download Jharkhand Board 12th Result 2019? Jharkhand Academy Council 12th Art Result will be announce on June 2019. JAC 12th Result 2019 will be announce in June of science and commerce stream. The result dates for Arts, Science & Commerce are yet to be announced by Jharkhand Academy Council. JAC website (jac.nic.in) is under maintenance. It will be resumed soon for services. Around 2 Lakhs students appear in Arts, Science and Commerce 12th Board Examination. The JAC board, Jharkhand will publish the Marksheet and send them to schools in May/June 2019. The candidates should contact their school and collect the JAC Jharkhand 12th Report card, Marksheet, and passing certificate. The Intermediate students enrolled in state board schools under Jharkhand Academic Council, Ranchi is waiting for JAC intermediate result date and the board is going to announce the JAC 12th Class Result 2019 date soon. The brief information about Class 12th Board Results is mention below. Name of Board: Jharkhand Academic Council. Examination Name: JAC 12th Board Written Exam. 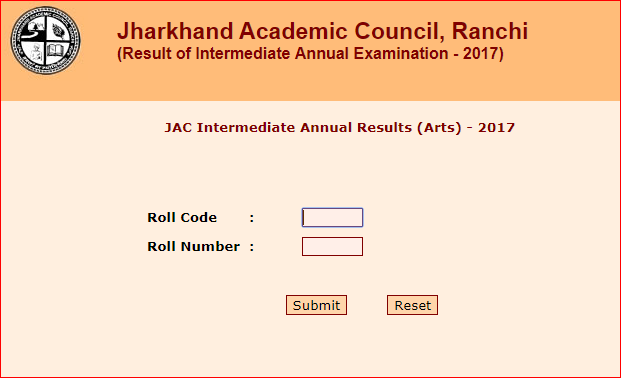 Official Website: www.jac.jharkhand.gov.in/result/ and www.jac.nic.in. The students who studied in 12th class in state board school affiliated to JAC, Ranchi and appeared for 12th Board examination in March 2019 can check their results on JAC official website. Also, the candidates who are looking for Jharkhand Intermediate Result 2019 Stream Wise (Science, Arts, and Commerce) are advised to visit JAC Official website (given above). The concern result can be checked by entering ROLL CODE & ROLL NUMBER. The ARTS stream result can be checked individually by clicking the “Intermediate ARTS Examination Result 2019” link on the official website. The Science stream result can be checked individually by clicking the “Intermediate Science Examination Result 2019” link on the official website. The Commerce stream result can be checked individually by clicking the “Intermediate Commerce Examination Result 2018” link on the official website. The JAC intermediate result can be checked, School Wise, Name Wise and Roll Number wise. The board will upload the result in may and publish under various heads with pass percentage and toppers name. keep watching this page to download the result. The steps to check and download the JAC board result 2019 is given below. Search for JAC, Ranchi official Website @ www.jac.nic.in. Click on “Result” button available in the header bar of the website. Find your streamwise link “Intermediate Arts, Science, Commerce Examination Result 2019”. Click and Enter your Credentials i.e. Roll Code and Roll Number. Finally, the “Result of 12th Class Jharkhand Board” will be displayed on the screen. Download and print result for future reference. The Jharkhand Intermediate Council will conduct the compartment exams of various subjects after the main exam result declaration. The compartmental or supplementary exams will be conducted in the month of June and the result will be published theirs after. The Jharkhand came into existence on 15 November 2000. Jharkhand Academic Council was established under an act by the Jharkhand State Legislature on 26 February 2003 and known as Jharkhand Academic Council Act 2002. The Jharkhand Academic Council was established for conducting board examinations of Intermediate, Secondary, Madhyama. Also regularising Madarsa from Vastaniyan to Fazil. Also, Plays important role in prescribing courses of studies for such examinations. Play important role in recognition of Intermediate Educational Institutions, High Schools, Sanskrit Schools and Madrasas to the State Government.